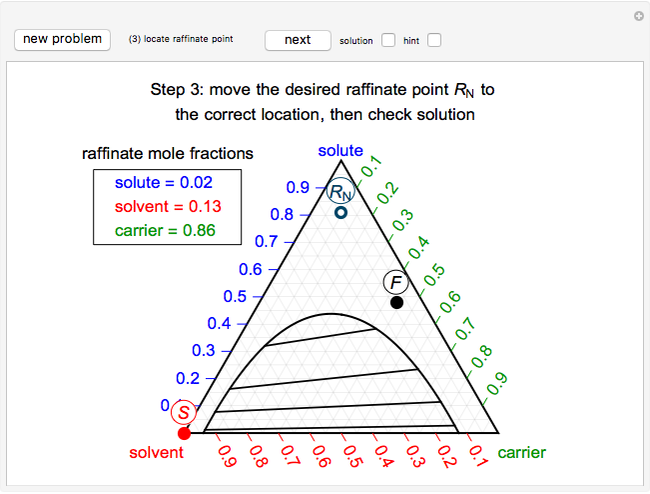 In this Demonstration, you can construct a ternary phase diagram step by step using the Hunter–Nash method to determine the number of equilibrium stages needed to achieve a certain separation. Press the "new problem" button to generate a new set of conditions; pressing this button takes you back to the beginning of the Demonstration. Check "solution" to see the answer. Once you check "solution", you cannot change your answers. Click "next" to move onto the next step, but once you press "next", you cannot go backward. where is the feed flow rate (kg/h); is the solvent flow rate (kg/h); is the combined feed and solvent flow rate (kg/h); , and refer to the mass fractions of the solute, solvent and carrier in ; and the superscripts , and refer to the three kinds of stream: feed, solvent and mixed. where is the line segment from the mixing point to the feed location , and is the line segment from the mixing point to the solvent location . A line is drawn from the desired raffinate composition through the mixing point until it intersects the phase boundary, giving the extract composition leaving stage 1, . A tie line from to the right side of the phase boundary yields the raffinate composition leaving stage 1, ; this line represents the first equilibrium stage. Thus, the extract composition leaving stage 2, , is found by drawing a straight line from to (because from the previous equation). Where this line intersects the left side of the phase boundary is the composition . This procedure is repeated for additional stages until the raffinate composition is nearly equal to the desired raffinate composition . The number of orange lines drawn is the number of equilibrium stages. 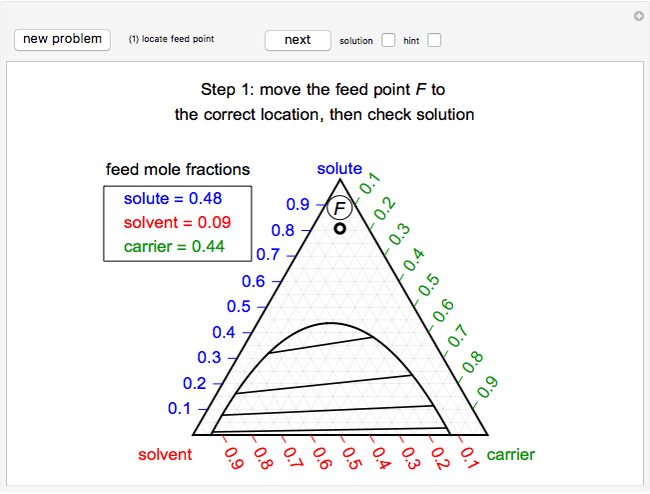 See [1–4] for screencasts that describe the Hunter–Nash method and present examples. 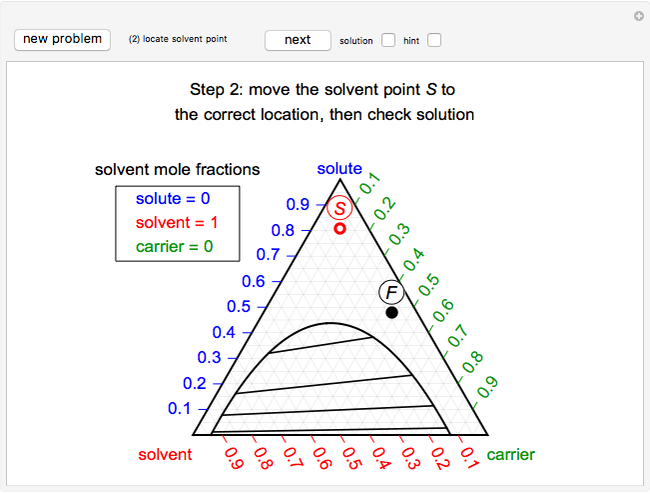 This Demonstration is a Mathematica version of a browser-based simulation . Hunter–Nash Method: Liquid-Liquid Extraction [Video]. (Apr 13, 2018) www.youtube.com/watch?v=e0Yt5RMkyj4. Hunter–Nash Method: Liquid-Liquid Extraction Example [Video]. (Apr 13, 2018) www.youtube.com/watch?v=FaKIZU3XPR8. Hunter–Nash Method 1: Mixing and Operating Points [Video]. (Apr 13, 2018) www.youtube.com/watch?v=-yW0jIcH0_E. Hunter–Nash Method 2: Number of Stages [Video]. (Apr 13, 2018) www.youtube.com/watch?v=JZuavrt8ksQ. T. Bánsági and T. L. Rodgers, Liquid-Liquid Extraction: Hunter-Nash Method. (Apr 13, 2018) chem.co.nf/LLE/ternary_hn.html. Rachael L. Baumann "Apply the Hunter-Nash Method to Liquid-Liquid Extraction"